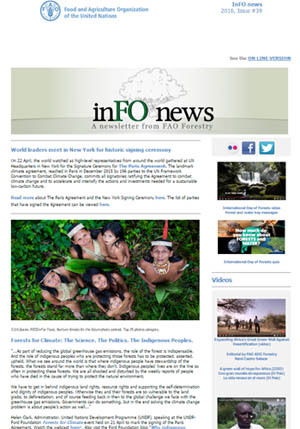 Follow the work of FAO Forestry and its partners in inFO news, a regular electronic news bulletin published in English by the FAO Forestry Department. Keep up-to-date on major activities and events designed to support countries and local communities in increasing sustainable forest management and food security, and reducing climate change. We take your views about inFO news seriously and welcome your feedback. Please send your comments to: forestry-news@fao.org. To subscribe, complete the online subscription form. InFO news is distributed free-of-charge by email and you may unsubscribe at any time.